The penultimate round of the 2014 eni FIM Superbike World witnessed a change of momentum for the title race, which will be decided on November 2nd at the Losail International Circuit in Qatar. 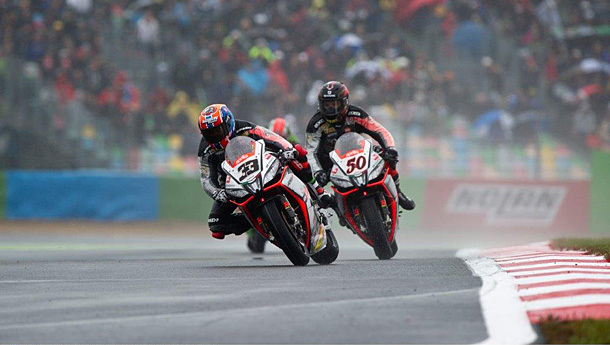 Thanks to a win and a second place in the two wet races at Magny-Cours, Sylvain Guintoli (Aprilia Racing Team) narrowed the gap to leader Tom Sykes (Kawasaki Racing Team) to just twelve points. The 32 year old Frenchman was cheered on by a vocal and enthusiastic, race weekend home crowd of over 74 000. 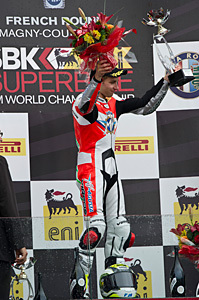 Marco Melandri, who was second and first in the two encounters, completed the perfect race meeting for Italian works manufacturer. The former 250cc World Champion showed great form once again by stepping atop the podium for the sixth time in twelve races. Sykes on the other hand did his best to contain the damage by finishing the two encounters in fourth place after claiming an impressive Pole Position in dry conditions the day before, when he took the outright fastest lap ever recorded at the circuit. 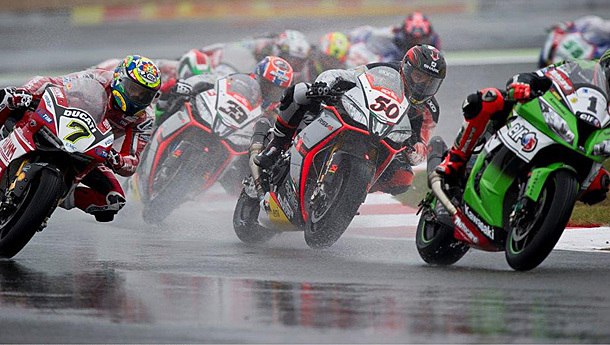 Tough going in the wet for Tom Sykes (1), Chaz Davies (7), Sylvain Guintoli (5)) and Marco Melandri (33). Magny-Cours (France), Sunday 5 October 2014 – Local rider Sylvain Guintoli (Aprilia Racing Team) took race one in front of an enthusiastic French crowd at the 11th round of the world superbike championship at Magny-Cours, edging out at the finish line his team-mate Marco Melandri. Thanks to his 3rd win of the year, the 32 year old Frenchman narrowed the gap to series leader Tom Sykes (Kawasaki Racing Team), 4th at the flag, to 19 points. 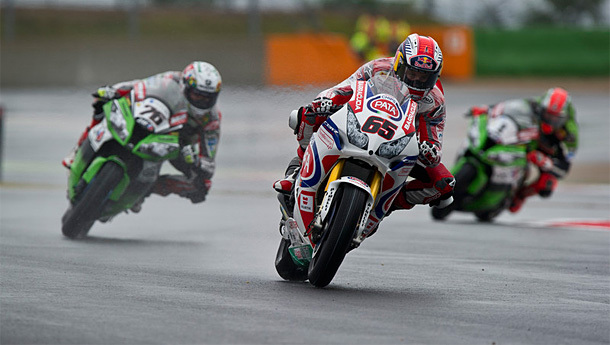 Jonathan Rea (Pata Honda World Superbike) scored a well deserved third place ahead of KRT duo of Sykes and Baz. Because of the wet weather, the race distance was reduced to 19 laps and after a number of riders fell in the warm up session, the opening laps were very tentative for several riders. 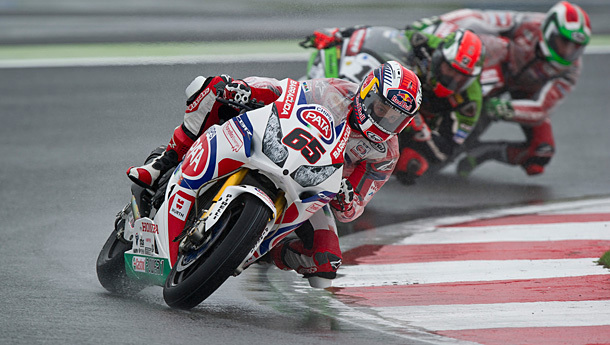 In the early laps, it was Rea who led the way with the spray making it extremely difficult for the mid-field riders. Behind him Sylvain Guintoli (Aprilia Racing Team) gave chase after passing Tom Sykes (Kawasaki Racing Team) at the end of lap 1. Guintoli was soon ahead of Rea and the Frenchman began to ease away, much to the delighted French crowd braving the wet conditions. By one third distance the Aprilia at the front was Guintoli, ahead of the chasing pack with Marco Melandri playing shotgun to his team mate. Just behind was Loris Baz who had also overhauled Sykes and Rea as they began to lose touch with the leaders. With five laps to go Melandri had closed to within a second and the Aprilia duo was left to fight it out for the win. Victory eventually went to Guintoli, after it appeared Aprilia team orders had intervened. In the EVO category, Sylvain Barrier (BMW Motorrad Italia) claimed a solid 10th position to close the gap on EVO points leader David Salom (Kawasaki Racing Team) who elected not to ride. Chaz Davies (Ducati Superbike Team), Toni Elias (Red Devils Roma Aprilia), Eugene Laverty (Voltcom Crescent Suzuki), Davide Giugliano (Ducati Superbike Team), Xavi Fores (3C Racing Team), Alessandro Andreozzi (Team Pedercini) all crashed without injury with Giugliano and Laverty re-joining to finish 7th and 19th respectively. Results: 1. Guintoli (Aprilia) 19 Laps/83.809 km in 36’45.206 average 136.818 kph; 2. Melandri (Aprilia) 2.257; 3. Rea (Honda) 5.954; 4. Sykes (Kawasaki) 15.670; 5. Baz (Kawasaki) 16.149; 6. Haslam (Honda) 29.411; 7. Giugliano (Ducati) 57.319; 8. Lanzi (Ducati) 59.306; 9. Neukirchner (Ducati) 1’12.274; 10. Barrier (BMW) 1’22.931; 11. Canepa (Ducati) 1’39.670; 12. Guarnoni (Kawasaki) 1’42.886; 13. Corti (MV Agusta) 2’03.253; 14. Staring (Kawasaki) 1 Lap; 15. Foret (Kawasaki) 1 Lap; 16. Salchaud (MV Agusta) 1 Lap; 17. Morais (Kawasaki) 2 Laps; 18. May (EBR) 2 Laps; 19. Laverty (Suzuki) 2 Laps; 20. Toth (BMW) 3 Laps; RT. Rizmayer (BMW); RT. Yates (EBR); RT. Fores (Ducati); RT. Andreozzi (Kawasaki); RT. Elias (Aprilia); RT. Lowes (Suzuki); RT. Davies (Ducati). 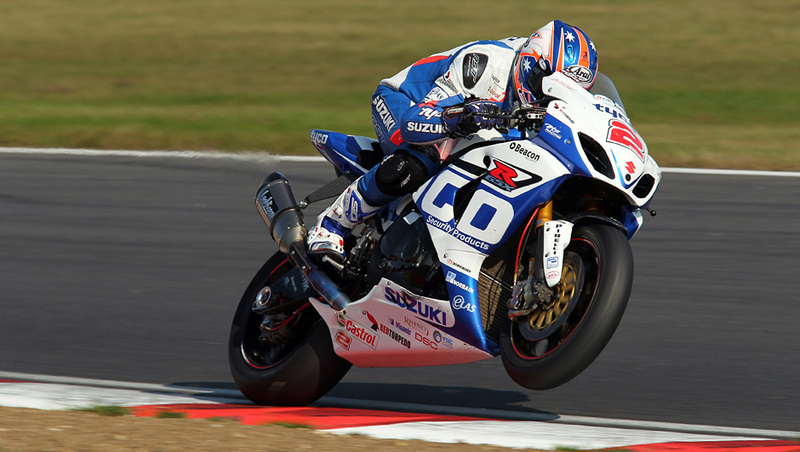 Marco Melandri turns the tables on Sylvain Guintoli in race two. Magny-Cours (France), Sunday 5 October 2014 – In similar conditions to the opening race of the day, Marco Melandri (Aprilia Racing Team) has won race two at Magny-Cours as he crossed the finish line with a 2.6 second advantage over team-mate, Sylvain Guintoli. Thanks to his sixth win in the last twelve races, Melandri elevates himself to third place in the standings, whilst Guintoli narrowed the gap to series leader Tom Sykes (Kawasaki Racing Team) down to 12 points. Earlier leaders Davide Giugliano and Jonathan Rea (Pata Honda World Superbike Team) both crashed spectacularly, before remounting only to retire to the pits. Rea’s crash left the Aprilia pairing of Sylvain Guintoli and Marco Melandri to dual it out for the victory with the Italian getting the better of his French teammate this time out. 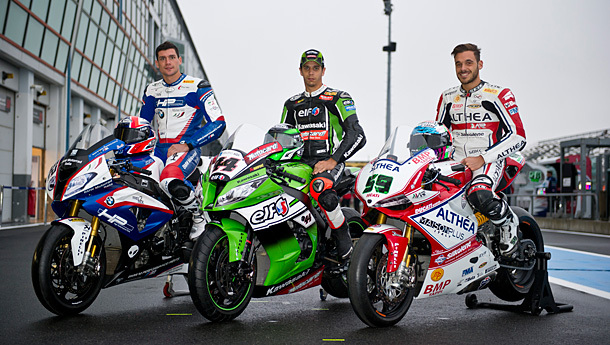 A well-earned podium finish in race two for Leon Haslam. Leon Haslam rode superbly aboard his Honda overhauling reigning champion Tom Sykes (Kawasaki Racing Team) in the closing stages to take his first podium since Misano 2012 and his first since joining the Pata Honda World Superbike team. Behind the top four, Lorenzo Lanzi (3C Racing Ducati), and his team-mate Max Neukirchner completed the top six. EVO riders L-R Sylvain Barrier, David Salem and Niccolo Canepa. 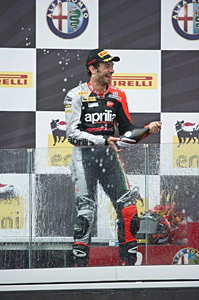 In the EVO fight, top honours went to Niccolò Canepa (Althea Racing Ducati). Best classified EVO rider in race one Sylvain Barrier (BMW Motorrad Italia) crashed twice, the second signalling the end of his race. He was uninjured. For Team Toth BMW it was a race for real celebration as both of their riders scored points in the same race for the first time in their short WSBK career. Results: 1. Melandri (Aprilia) 19 Laps/83.809 km in 36’25.402 average 138.058 kph; 2. Guintoli (Aprilia) 2.669; 3. Haslam (Honda) 16.450; 4. Sykes (Kawasaki) 20.759; 5. Lanzi (Ducati) 46.689; 6. Neukirchner (Ducati) 58.490; 7. Baz (Kawasaki) 1’03.100; 8. Corti (MV Agusta) 1’24.699; 9. Davies (Ducati) 1’27.899; 10. Canepa (Ducati) 1’51.706; 11. Foret (Kawasaki) 1 Lap; 12. Rizmayer (BMW) 2 Laps; 13. Toth (BMW) 2 Laps; RT. Staring (Kawasaki); RT. Laverty (Suzuki); RT. Fores (Ducati); RT. Guarnoni (Kawasaki); RT. Rea (Honda); RT. Barrier (BMW); RT. Morais (Kawasaki); RT. Giugliano (Ducati); RT. May (EBR); RT. Lowes (Suzuki); RT. Yates (EBR); RT. Elias (Aprilia); RT. Salchaud (MV Agusta); NS. Andreozzi (Kawasaki). Jules Cluzel celebrates his victory in World Supersport. 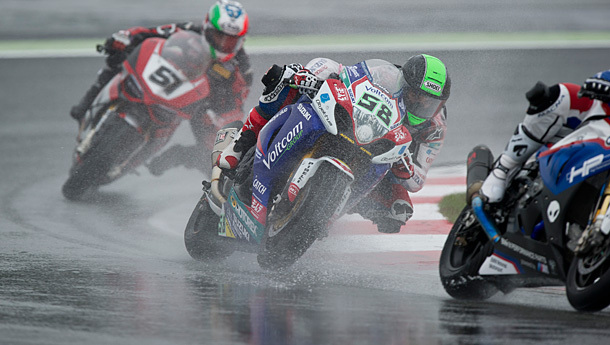 The penultimate round of the World Supersport championship was held in difficult conditions over a reduced race distance of 17 laps but cut short after 12 laps. Full of drama with a number of riders crashing out, the victory eventually went in emphatic style to Frenchman Jules Cluzel (MV Agusta Reparto Corse) who claimed his third win of the year by over 18 seconds. Newly crowned champion Michael van der Mark (Pata Honda World Supersport) finished 2nd after falling, remounting and then passing several riders to move back onto the podium on lap 10. Roberto Rolfo (Go Eleven Kawasaki) started 17th to win a tense fight for the final podium position ahead of Lorenzo Zanetti (Pata Honda World Supersport), Florian Marino (Kawasaki Intermoto Ponyexpres), Kev Coghlan (DMC-Panavto Yamaha) who completed the top 6. 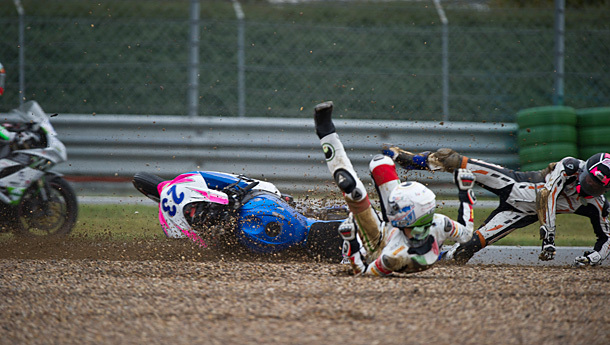 Alessandro Nocco wasn’t the only one to come to grief at Magny-Cours. Results: 1. Cluzel (MV Agusta) 12 Laps/52.932 km in 23’54.426 average 132.844 kph; 2. vd Mark (Honda) 20.274; 3. Rolfo (Kawasaki) 24.232; 4. Zanetti (Honda) 24.911; 5. Marino (Kawasaki) 26.599; 6. Coghlan (Yamaha) 26.860; 7. Tamburini (Kawasaki) 28.110; 8. Jacobsen (Kawasaki) 29.777; 9. Wilairot (Honda) 53.463; 10. Schmitter (Yamaha) 54.266; 11. Marconi (Honda) 57.226; 12. Law (Kawasaki) 1’07.547; 13. Davies (Honda) 1’10.889; 14. Gamarino (Kawasaki) 1’20.101; 15. Roccoli (MV Agusta) 1’27.838; etc. Standings (Round 10 of 11): 1. vd Mark 205; 2. Cluzel 132; 3. Marino 120; 4. Zanetti 103; 5. Coghlan 98; 6. Jacobsen 95; 7. Rolfo 87; 8. Sofuoglu 86; 9. De Rosa 67; 10. Tamburini 63; 11. Kennedy 56; 12. Wilairot 50; 13. Bussolotti 30; 14. Nocco 27; 15. Wahr 26; 16. Russo 25; 17. Gamarino 25; 18. Menghi 20; 19. Leonov 19; 20. Schmitter 14; etc. Manufacturers: 1. Honda 226; 2. Kawasaki 171; 3. MV Agusta 146; 4. Yamaha 108; 5. Triumph 9.